Children love learning magic tricks. I can always tell when a new magic trick is being passed around at school because a handful of excited children will all show me the trick on the same day! 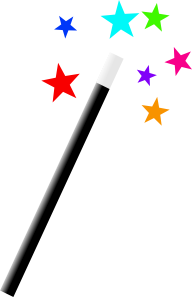 Why not capture that magic and excitement by offering up a Magic Club? What child would not want to be encased in a giant bubble? (ok even as an adult I would want to do this.) Really adorable idea!!! And very doable in the after school setting. 2) Learn Magic tricks– Here is a link to activity village with some great magic trick videos. Use the wax crayon to write secret messages on white paper. Use watercolor paint to reveal the secret message ~ like magic! Supplies needed: clear wax crayons from Easter Egg Kits, white paper, watercolors, paintbrushes. 4) Special Event- Have a special visitor “magician” put on a Magic Show or demonstration for the students. Hope you have a bippity boppity magically teriffic time with your magic club!